His Holiness Patriarch Mor Ignatius Aphrem II met with His Excellency Sheikh Sheikh Abdallah Bin Mohammed Bin Abdallah Al Salmi, Minister of Endowment & Religious Affairs, at the Ministry of Heritage and Culture in Muscat. 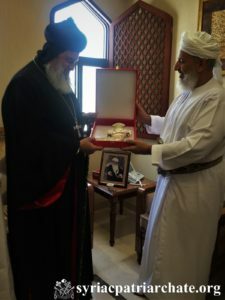 His Excellency welcomed His Holiness in the Sultanate of Oman, and expressed his pleasure to meet with the head of the Pontiff of the Syriac Orthodox Church of Antioch. His Holiness thanked His Excellency for his warm welcome, and showed his gladness towards religious tolerance in Oman. During their meeting, His Holiness and His Excellency discussed various issues related to the current crisis in Syria. They also had a cultural discussion in which they spoke about the history of our Syriac Church and that of the Arab countries. The meeting was attended by their Eminences: Mor Ireneos Paulose, Patriarchal Vicar of Oman and Metropolitan of Kozhikkod Diocese, Mor Clemis Daniel Kourieh, Metropolitan of Beirut, and Mor Timotheos Matthew, Patriarchal Secretary for Indian Affairs, as well as Very Rev. Raban Joseph Bali, Patriarchal Secretary and Media Office Director. At the end of the meeting, His Holiness and His Excellency exchanged tokens of respect.